Well, that was the week that was. I’m not long back from our Winter Show, via a funeral up north first. First of all. A massive thank you to everyone that attended, your support is greatly appreciated, that goes out to the trade, the customers and the people that put the show together and the people that help out over the weekend. It’s a team effort and the show wouldn’t happen without all your contributions so thank you very much from everyone at The Carp Society. We are absolutely thrilled to announce that this year we broke all records with the attendance, we had over 5,000 people attend the show, long may that continue. I did read a couple of comments that a few people thought the show was poorly attended. I’m not going to go down that road, suffice to say, it wasn’t. The last couple of years we have taken on 50% more floor space and we have slightly altered the lay out of the stalls to make it a bit more comfortable for people. So rather than being crammed in like sardines there is actually now more room for people to walk about comfortably and look at the stands and displays in comfort. This obviously as given some people the impression that the show isn’t as popular as it once was. In fact nothing could be further from the truth. We have had a 25% increase in attendance since 2014. We are guilty of having too much quality on our forums though. This year’s speakers were Chilly, Terry Hearn and Terry Dempsey, and it was standing room only on both days for all the speakers. After Terry Hearns talk on Saturday he did comment to Chris Ball that that was the most people he had ever spoken in front of. I don’t know what he made of Sundays talk as that was even busier, given that Sunday we had over 3,000 people attend the show. With the talks being so well attended it obviously meant less people walking round the stalls, so maybe that gave a false impression. Or maybe some people are just born to criticise? I don’t know. Either way I do know it was a brilliant show and I’m certainly not going to allow a couple of agenderists to give you the impression it was anything but. We had a great time on The Carp Society stand meeting people and talking about all things Society related. It was great to hear so many people being so positive about the development of Horseshoe and the quality of the fishing we now have. It genuinely fills me with gladness that people can see and appreciate what we are doing, so thank you all very much for your kind words. This year was double’y (I know there’s no such word) exciting for us as it was the launch of our new book, ’Still for the love of Carp’. Having had a preview of the book before the show I know it’s a fantastic book with some fantastic people all contributing a chapter each. It’s brilliant that these good people not only contributed to the book free of charge but most of them turned up free of charge to sign copies at the show. It was very surreal for me personally. I’ve got a chapter in the book, so had to take my place in the line-up for the signings. It’s not my thing as it is and I was shrivelled with embarrassment as it was but then to be sat there alongside Chilly, Mike Kavanagh, Dave Levy, Julian Cundiff, Derek Stritton , Brian Skoyles, Mike Starkey and all the other fantastic people (please forgive me if I haven’t mentioned you) well, to say I felt like a bit of a fraud would be a massive understatement. Has you can imagine, I have received countless mickey taking messages and comments, but it is what it is and secretly I was honoured to be part of it all. The book sold really well, we still have a few copies to shift, although all the signed ones and the leather bound ones are now gone. 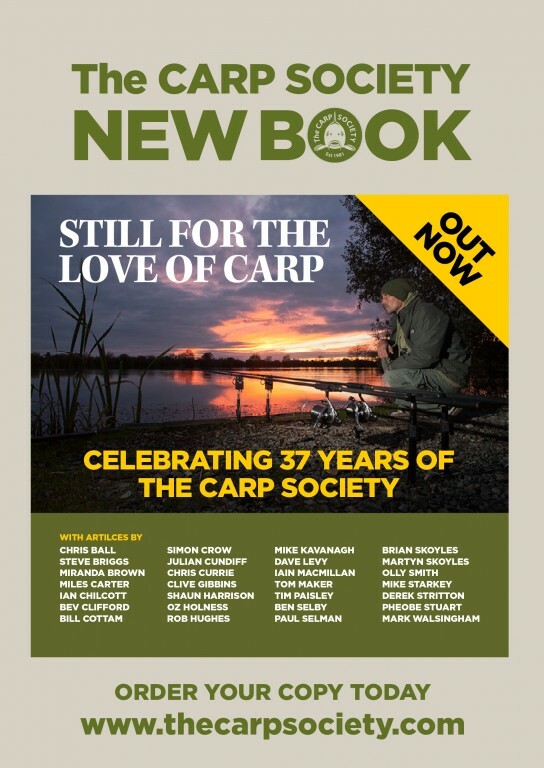 You can order a copy via our website www.thecarpsociety.com and I dare say we will be taking a few copies around to some of the shows in 2019. If I say so myself it’s a great read and definitely one for the collection, and at the risk of sounding like Mikes Carpets, order now in time for Christmas. Whilst I’m on a sales drive I may as well tell you of a few other Carp Society things we have recently took stock of for your delight. We’ve got some great looking Society thermal mugs (and Carp Radio ones), we’ve got key rings, car air fresheners, ceramic mugs, stickers, badges, some great little stocking fillers. We also have a good range of Carp Society branded clothing. Check out the website and see if there’s owt you fancy. Whilst at the show we signed up for Viv Shears fantastic new initiative ‘Anglers National Line Recycling Scheme’ this is such a brilliant scheme, basically what it is is that you drop your old fishing line off at your local angling shop. You can do this at Horseshoe Lake as well. The line then gets collected and sent away where it’s recycled and made into something useful. It’s so simple yet so astronomically good. I had a chat with Viv for a future Carp Radio show and some of the statistics he was telling me about how much line we have sent to landfill over the years and how long it takes to break down, we are talking hundreds of years, is mind blowing. Visit the website and check it out for yourselves, it will blow you away. So please join us in joining Viv and Steve and let’s get this thing going. I know we don’t have some of the larger companies, the likes of Korda and Fox attend our shows, personally I think their missing out, but there are so many shows now that manufactures and retailers are picking and choosing which ones to attend. The stand holders do lay out a lot of money to attend shows, not just paying for space but there’s the travel, the accommodation, the wages etc so it’s understandable that they give it a bit of thought before committing to a show, and if you’ve got a choice between our show that attracts 4,000 (though we had 5,000 this year) or The Northern Show which attracts 18,000 to 20,000 then you’d probably be looking to attend the Northern Show. There are other shows I know of that give the “Bigger” companies free stand space, so that comes into play. We can’t compete with people giving space away so we are going to suffer from that. The bigger companies not coming is not a massive problem to us, but it does leave us open to the agenderists to criticise, but I can assure you we do everything in our power to get everyone to the show, but at the end of the day if they don’t want to come then that’s their decision and we respect that and bat on without them. We are certainly not going to fall out with anyone for not attending the show. As I mentioned earlier, they have a lot of choice now and they have to put their business interests before blindly supporting us. We will keep plugging away at them though, but regardless the show will go on, and hopefully you’ll all keep supporting it. The Carp Society has been putting shows on for over 30 years now. I did hear someone say that the Carp Society show is like a Jazz club where as other shows are like The Hacienda and I quite like that. We are a smaller more intimate show with the emphasis, as it’s always been, on bringing likeminded people together to meet up and enjoy their selves in a nice relaxed environment, catch up with old friends, buy a few bits and bats, just have a nice day. Carp fishing seems to be more and more about competition than enjoyment and fun these days, and that’s quite sad. I don’t know about you but I go fishing to relax, unwind, chill out, forget about the daily slog and the crap that just staying alive entails these days and I think our show reflex that. Harmonise don’t criticise.